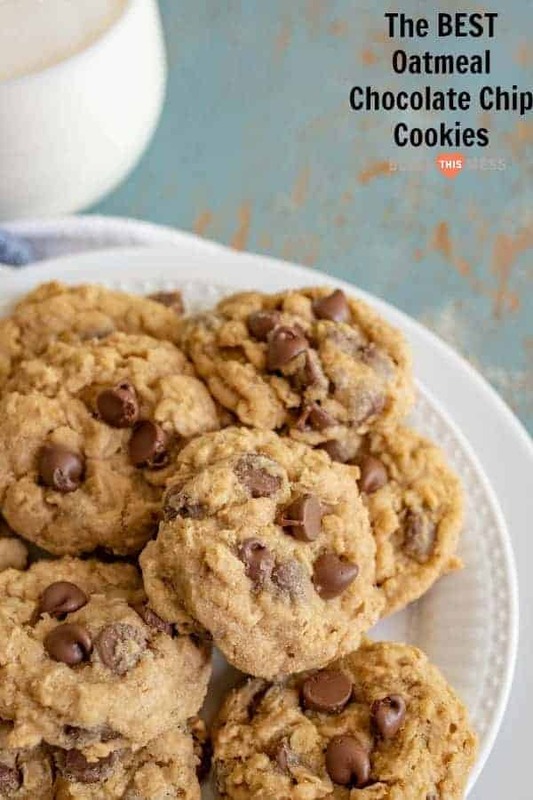 Oatmeal Chocolate Chip Cookies Recipe | Easy, Soft & Chewy Cookies! 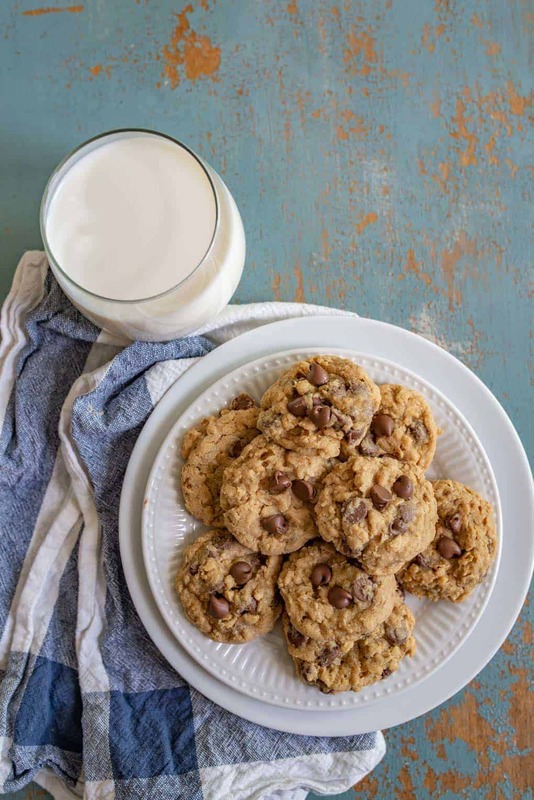 Our favorite soft and chewy homemade Oatmeal Chocolate Chip Cookie recipe made with butter, old-fashioned rolled oats, and lots of chocolate chips! I love a chewy oatmeal cookie that is stuffed with chocolate chips. 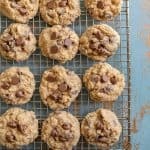 This is my go-to oatmeal chocolate chip cookie recipe that I’ve been making for years and years. 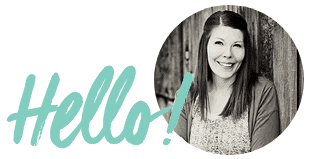 It’s a standard in our house, and I can’t wait for you to start making it in your home, too. It’s a classic cookie recipe that you can make all year long. 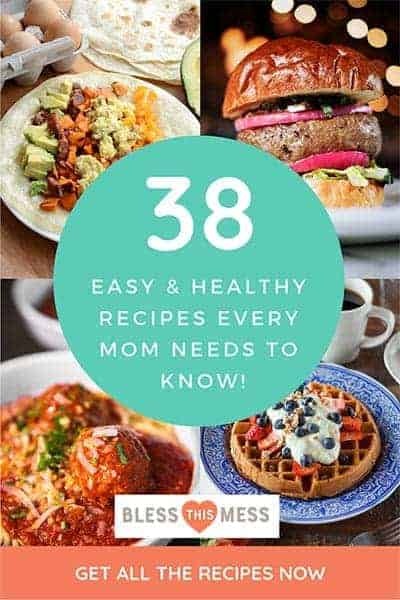 My kids often request this recipe and I like to surprise them with a batch after school or while friends are over playing. There’s just something magical about warm cookies on the counter. Using oats in cookies is a favorite of mine. I love the look, the taste, and the texture, and they are a whole grain so that makes these a suitable option for breakfast, right? Seriously, what’s not to like about these? I often get asked about what kinds of oats to use when it comes to different recipes, so here’s my opinion on what kind of oats to use for cookies. Can I use old fashioned oats instead of quick oats? And vice-versa? Both are whole grain oats that have been flattened with large rollers, but quick-cooking oats are cut into smaller pieces. 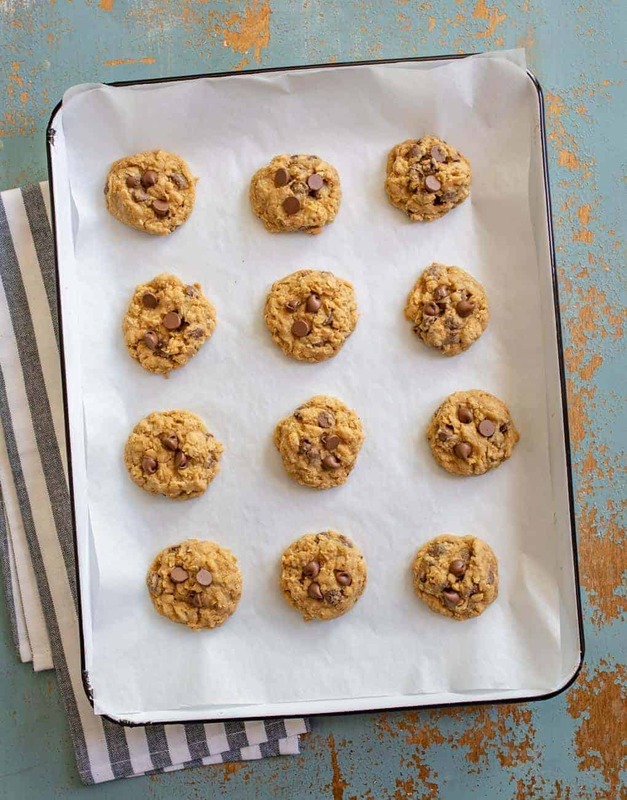 As a result, quick-cooking oats cook faster, and they offer a more delicate texture to cookies and other desserts. If you want a heartier texture, use old-fashioned oats. If you like the less chewy texture, go for the quick oats. Happy baking friends! Enjoy a cookie for me. I liked to use old-fashioned rolled oats for this recipe but feel free to use quick or minute oats if that’s what you have on hand. The texture will be less “toothsome” or chewy but they will still be delicious. Use whatever chocolate chips you like or have on hand. You can use dark, semi-sweet, milk, mini, or even something like a mint chocolate chip if you like. The choice is yours. I like half milk and half semi-sweet in this recipe. These cookies freeze well! I like to bake the whole batch and save half of the baked cookies in freezer bags for another day. Just let the frozen cookies come to room temperature before serving (though they are delicious cold, too!). 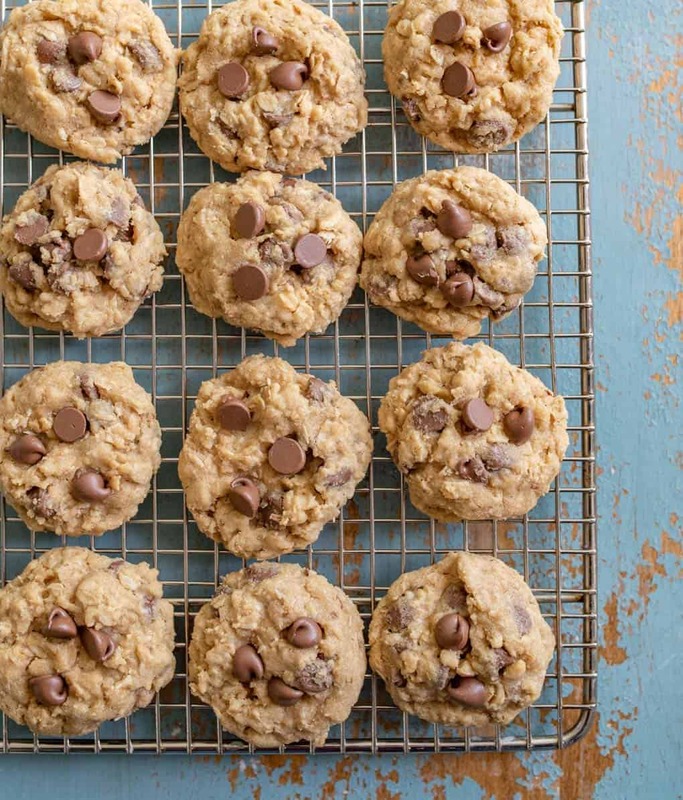 Our favorite soft and chewy homemade Oatmeal Chocolate Chip Cookies made with butter, old-fashioned rolled oats, and lots of chocolate chips! Preheat the oven to 325 degrees and line your baking sheets with parchment paper. Add the butter and the brown sugar to the bowl of your stand mixer (or use a hand mixer) and beat on medium speed until the mixture is light and fluffy, around 2 minutes. Add the egg and vanilla and beat for another minute. Add the flour, sprinkle on the baking soda, baking powder, and salt. Mix until combined. Add the oats and combine. Add the chocolate chips and stir until they are just mixed in. Use a cookie scoop to make balls from 1 tablespoon of cookie dough each and place on prepared cookie sheet 2 inches apart. Bake for 9 to 11 minutes until the edges begin to brown and the centers are set. Transfer to a wire rack and let cool completely. I like to use old-fashioned rolled oats for this recipe but feel free to use quick or minute oats if that’s what you have on hand. The texture will be less “toothsome” or chewy but they will still be delicious. 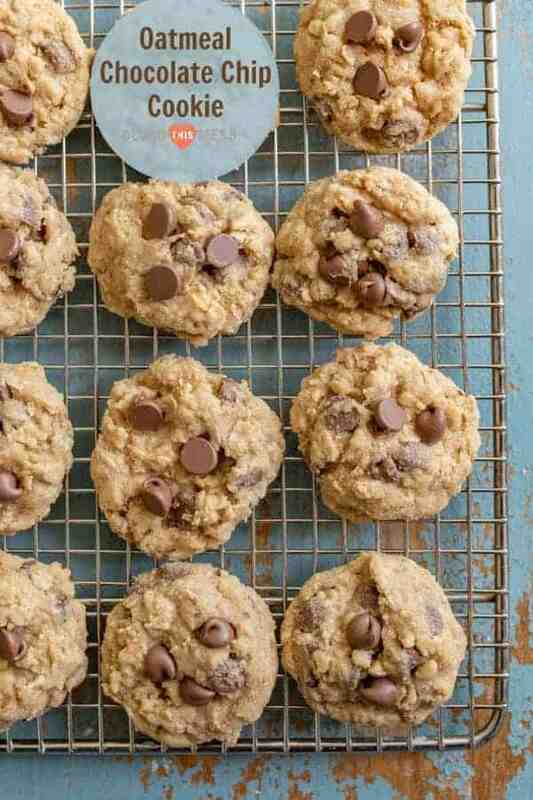 Love Oatmeal Chocolate Chip Cookies? You’ll love these other cookie recipes, too! I wish I had some of these in the freezer right now! I have some lag time when it comes to making, photographing, and writing up a recipe and this batch was eaten long before I’m now sitting down to write about them. I think I need to head to the kitchen ASAP. Love how easy these are! Yummy!